For many a Geek there are one or two defining shops in their teenage life which stand out. For many that shop has been a shared passion and pilgrimage whenever their feet have stood upon Londons soil. That shop is . The point of this post is three fold. Forbidden Planet ( dotcom ) will be celebrating their 30th anniversary and to mark this occasion they are running a competition by way of a Vote to discover the most oustanding moments and monuments in Science Fiction, Fantasy and Culy Entertainment. Its the Usual Suspects [ sorry at it again ] of questions with a prize draw to be announced sometime after the 15th of August when the poll closes. The Top ten from each category will be announced on the 20th. So go there and vote. I really enjoy visiting Forbidden Planet ( dotCom ) so you would think that their Website would be a second fiddle to the content and experience of the shop visit. What I have discovered though is that the site Highlights many hidden gems of merchandise and “stuff” that would have been passed by in buzz of the shop. These gems have included. 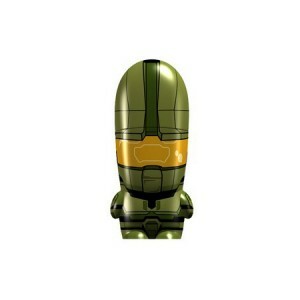 The Master Chief from Halo as a MimoBot. Rip of his helmet and shove him into your SUB port. Cortana never had it so easy. I love mimobots and this one brings the memorys flooding back. What is not to love about Iron Man? 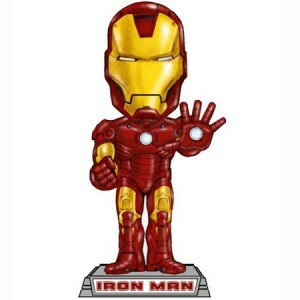 Especially Iron Man with a Bobble Head ! Sadly though I still find I cannot locate any Killer Bunnies. Since I am not going to get a lot of time in August and September I would like to make another Pilgrimage to the London store. If you would like to join me and share a social media outing to the land of our Geekfathers then drop me a comment and lets sort out a post Social Media Cafe jaunt to the real dotCom. I’m always up for a visit. Specially as I occasionally work out of the office next door!